We love our bird baths. We regard them as a good waste of time. The visiting birds bring us so much joy and entertainment. During the warm weather like we’ve been having this summer, I daily refill each bird bath before I have breakfast. This meal is usually eaten in our sun room – just a few metres from several of the bird baths. During warm weather there is a constant stream of birds coming to drink and/or bathe. Almost every day there is something of note worth stopping to watch. On this occasion I had my camera ready. 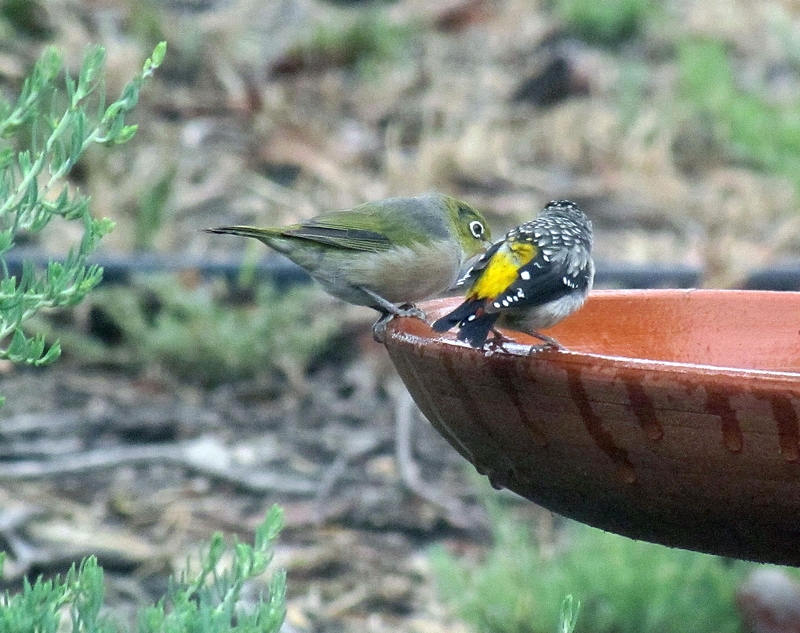 A Spotted Pardalote and a Silvereye drinking side by side is an unusual sight. They seem almost as if they are chatting about the hot weather – or perhaps even the vintage of the water! Yesterday I wrote about the Silvereyes that visit our garden (click here to read). The Spotted Pardalote is another frequent visitor to the bird baths and I regard it as a resident breeding species on our 5 acre property. Hardly a day goes by without them visiting the bird bath – in fact, they seem to visit every few minutes during the hottest parts of the day. The colours on the one shown in the photo above are particularly brilliant. It could mean that it is showing its full breeding plumage. Wonderful pics Trevor. I accidentally happened upon your blog this week, so glad I did. Silvereyes and Pardalotes are two of my favourite birds.